He married Nellie Mae Hagans1,15 [Nellie Mae Haggens16], Dec 2 19081,15, Ashland, Boone County, Missouri1,15. Nellie, daughter of Richard Martin Hagans & Mary Jane "Mollie" Burnett1,2,3,5,6,14,17, was born May 25 18911,2,3,5,6,14,17 [May - 189318], east of Ashland, Boone County, Missouri1,2,3,5,6,14,17. Hinshaw, James R., head-of-household, age 23, born in Missouri; parents born in Missouri; first marriage, married 2 years; occupation: farmer, general farm; rented farm. Hinshaw, Nellie M., wife, age 19, born in Missouri; parents born in Missouri; first marriage, married 2 years; 1 child, 1 living. 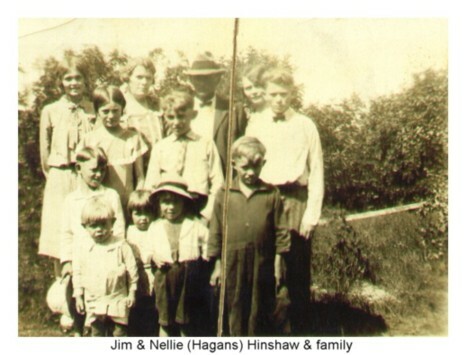 Hinshaw, Velma C., daughter, age ? months [unclear], born in Missouri; parents born in Missouri. Hinshaw, James R., head-of-household, age 33, born in Missouri; parents born in Missouri; rented home; occupation: farmer. 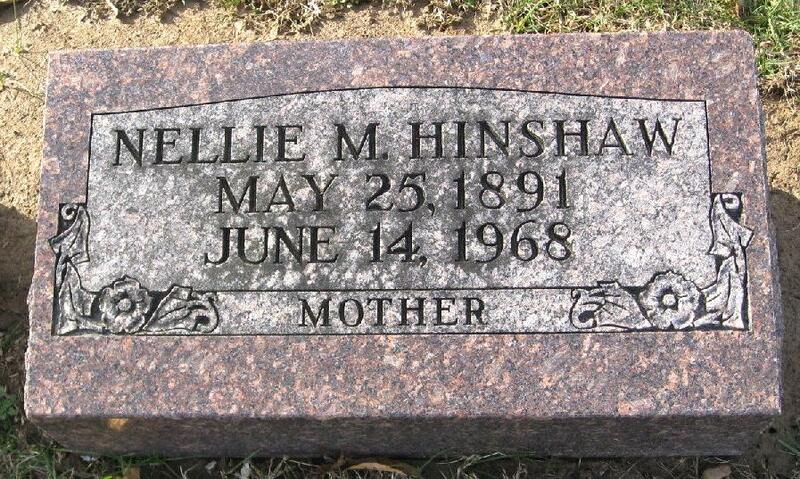 Hinshaw, Nellie M., wife, age 28, born in Missouri; parents born in Missouri. Hinshaw, Velma C., daughter, age 10, born in Missouri; parents born in Missouri; attended school. 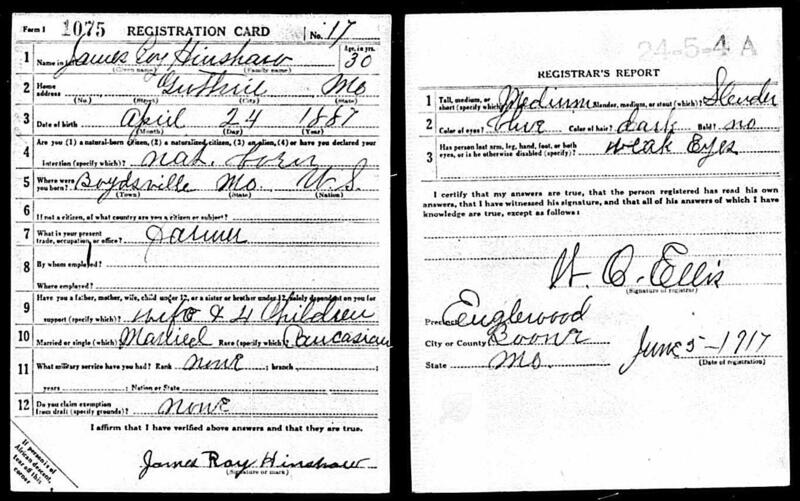 Hinshaw, Irene S. [sic], daughter, age 8, born in Missouri; parents born in Missouri; attended school. Hinshaw, Casper B., son, age 5, born in Missouri; parents born in Missouri. Hinshaw, Mona M., daughter, age 3 years 8 months, born in Missouri; parents born in Missouri. Hinshaw, Roy H., son, age 1 year 7 months, born in Missouri; parents born in Missouri. 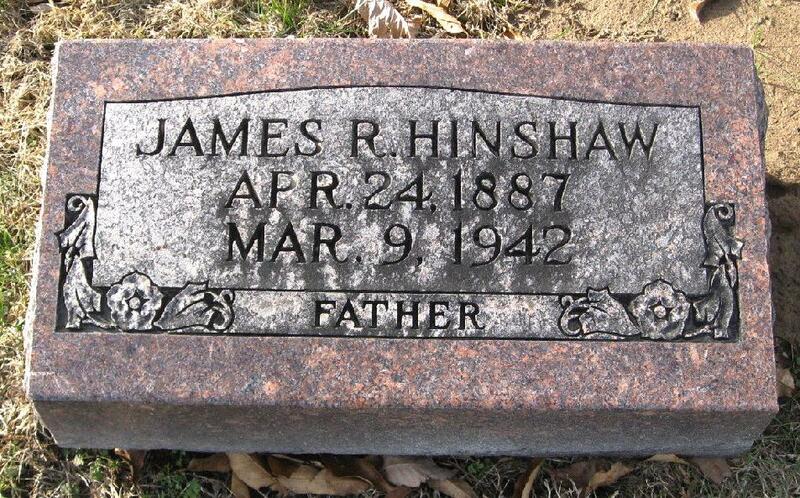 Hinshaw, James R., head-of-household, age 42, born in Missouri; parents born in Missouri; rented home; no radio in home; occupation: farmer, stock farm; not a war veteran. 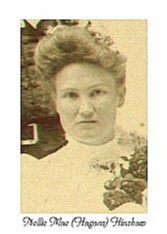 Hinshaw, Nellie E., wife, age 38, born in Missouri; parents born in Missouri. Hinshaw, Boyd C., son, age 15, born in Missouri; parents born in Missouri. 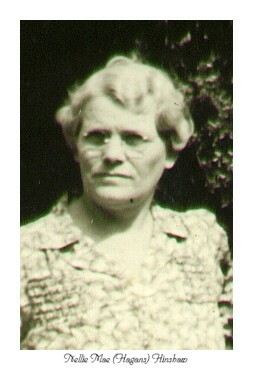 Hinshaw, Mona M., daughter, age 14, born in Missouri; parents born in Missouri; attended school. Hinshaw, Roy H., son, age 11, born in Missouri; parents born in Missouri; attended school. Hinshaw, Kenneth R., son, age 10, born in Missouri; parents born in Missouri; attended school. Hinshaw, Elwood F., son, age 7, born in Missouri; parents born in Missouri; attended school. Hinshaw, Paul J., son, age 6, born in Missouri; parents born in Missouri. Hinshaw, Adeliah M., daughter, age 5, born in Missouri; parents born in Missouri. Hinshaw, Therion M., son, age 3 years 11 months, born in Missouri; parents born in Missouri. 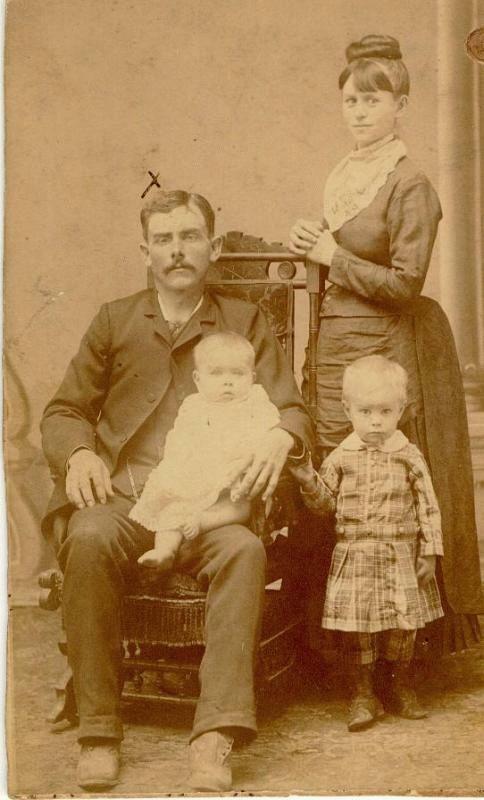 Hinshaw, Cecil A., son, age 0 years 6 months, born in Missouri; parents born in Missouri. Hinshaw, James R, head-of-household, age 52, born in Missouri; completed 7th grade; on Apr 1 1935 was living in rural Boone County, Missouri; rented farm ($10/month rent); occupation: laborer, farm; worked 40 weeks in 1939; $360 wages in 1939. Hinshaw, Nellie Mae, wife, age 48, born in Missouri; completed 7th grade; on Apr 1 1935 was living in rural Boone County, Missouri. Hinshaw, Roy H., son, age 21, born in Missouri; completed 8th grade; on Apr 1 1935 was living in rural Boone County, Missouri; occupation: laborer, Field Project; worked 52 weeks in 1939; $360 wages in 1939. Hinshaw, Elwood, son, age 17, born in Missouri; completed 8th grade; on Apr 1 1935 was living in rural Boone County, Missouri; occupation: laborer, farm. Hinshaw, Marie, daughter, age 14, born in Missouri; completed 8th grade; on Apr 1 1935 was living in rural Boone County, Missouri. Hinshaw, Therion, son, age 13, born in Missouri; completed 7th grade; on Apr 1 1935 was living in rural Boone County, Missouri; attended school. Hinshaw, Allen, son, age 10, born in Missouri; completed 4th grade; on Apr 1 1935 was living in rural Boone County, Missouri; attended school. Hinshaw, Jimmie, son, age 7, born in Missouri; completed 1st grade; on Apr 1 1935 was living in rural Boone County, Missouri; attended school. Mrs. Nellie Maye Hinshaw, 77, died at 6:10 a.m. Friday in Campbell House, Centralia, after an eight month illness. 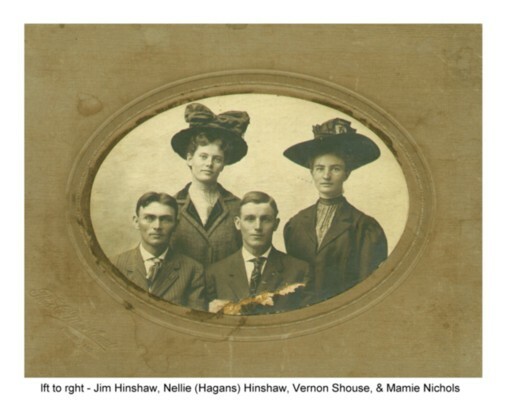 She was born May 25, 1891, east of Ashland, the daughter of Richard M. and Mary Jane Burnette Hagans, Mrs. Hinshaw married James R. Hinshaw in 1908. He died March 9, 1942. Mrs. Hinshaw was a member of the Wilkes Blvd. Methodist Church and is survived by four daughters, six sons, 34 grandchildren, 13 great grandchildren and one sister, Mrs. Gertrude Moreau, 301 Ridgeway Ave. Daughters are Mrs. Lloyd Bennett, Route 2; Mrs. Mona Hughes, 113 Second Ave.; Mrs. Marie Wilhite, 10 Fist Ave., and Mrs. Bud Ballard, Kansas City. Sons are Roy Hinshaw, Route 5; Paul Hinshaw, 421 Sandford Ave.; Allen Hinshaw, 310 Ridgeway Ave., and Jim Hinshaw, Route 6; Kenneth Hinshaw and Elwood Hinshaw, both of St. Louis and Theriod (Therion) Hinshaw, Jefferson City. A seventh son, Boyd Hinshaw, died earlier. Services will be conducted by Rev. J. Truman Quigley at 2 p.m. today in Burnett Funeral Chapel, Ashland. Burial will be at New Liberty Cemetery, Northwest of Ashland. Pallbearers will be Ronnie Hughes, Charles Wayne Thurston, Willard and Harry Moreau, and Leon and Hulen Hagans. 1910 census, Cedar Township, Boone County, Missouri; roll T624-770, ED 5, page 61B, line #64, dwelling #75, family #78. 1920 census, Cedar Township, Boone County, Missouri; roll T625-906, ED 6, page 7A-7B, line #46, dwelling #142, family #142. The Columbia (Missouri) Tribune, Oct 18 1994. Obituary of Therion Martin Hinshaw. Boone County, Missouri, Cemetery Records; http://www.ancestry.com. 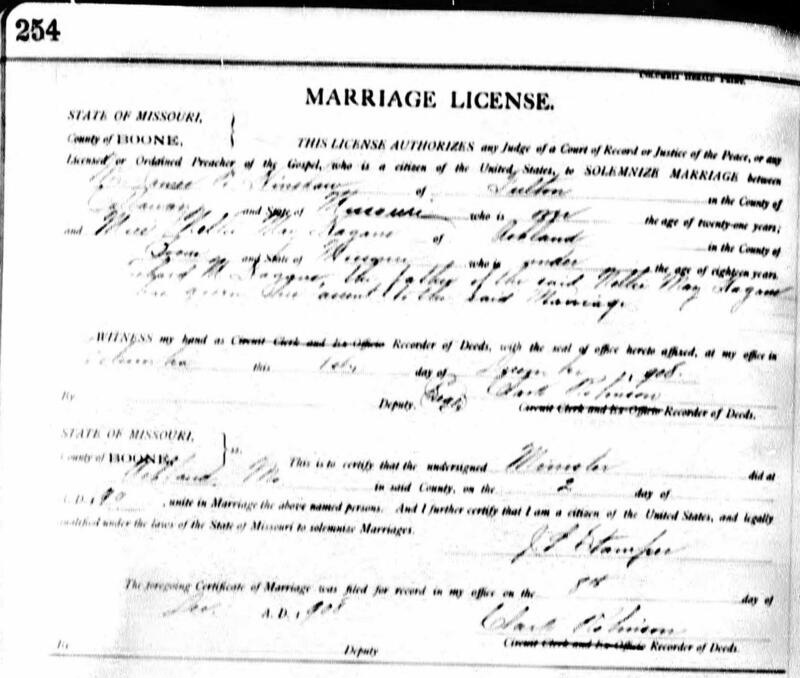 Missouri, Marriage Records, 1805-2002; http://www.ancestry.com. 1900 census, Cedar Township, Boone County, Missouri; roll T623-840, ED 17, page 14A, line #25, dwelling #264, family #269. 1910 census, Cedar Township, Boone County, Missouri; roll T624-770, ED 5, page 61B, line #83, dwelling #78, family #81.